A battery box was glassed into the forward end of the port underseat cockpit locker. 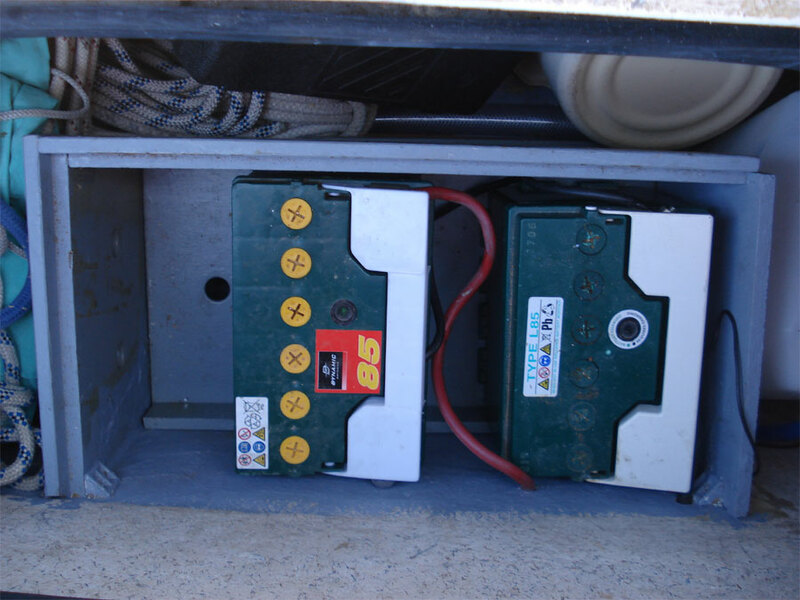 The intention was to have three deep cycling 80ah batteries but in the event two have always been more than required. The box is seen here without its lid – which when in place (see below) provides a useful ledge on which to stow things needed readily to hand. 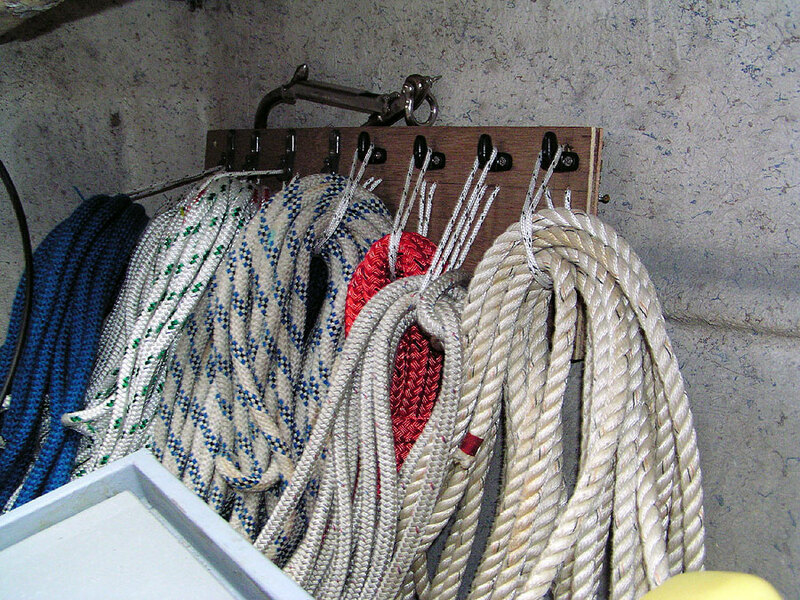 Otherwise the port locker is reserved for cleanish things like ropes, flags and the washing-up bowl. To help organise the stowage of warps, a ply board was screwed to the hull stringer. This has loops of cord attached through two holes and hooks so that the ropes can be hung from the board. The port locker also houses the 2 gallon water can that feeds the sink pump ‘temporarily’ (that is, since 2003) pending the fitting a of a new water tank in the forepeak. The result, with batteries, water and diesel in the cockpit lockers is that Lottie’s trim is rather down at the stern. 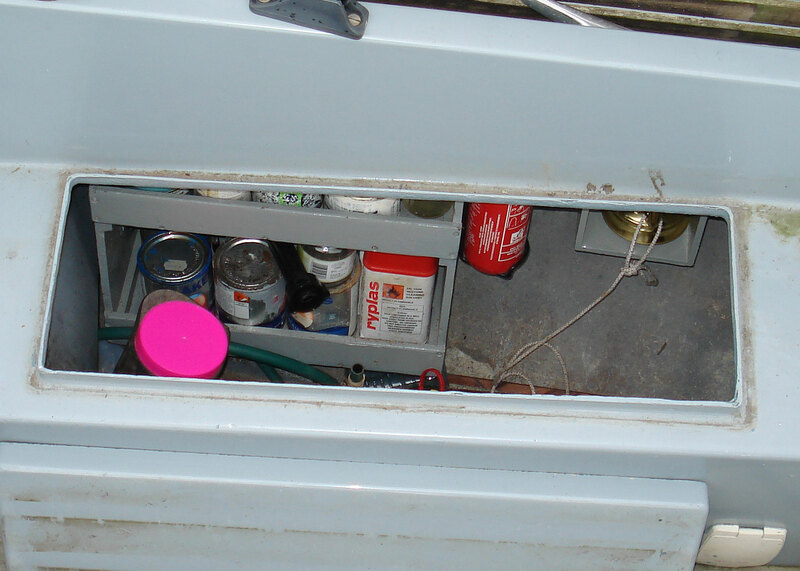 The diesel tank occupies the forward end and the starboard locker is the place for dirtier items such diesel cans, funnels, oil, paint and the outboard if necessary. A simple rack of shelves was knocked up from some scrap 12mm ply to hold all the bits and pieces that would otherwise tumble about in the bottom of the locker. It also provided somewhere to mount a fire extinguisher. The shelves were screwed to the stringer along with a second box tailored to protect the brass hurricane lamp which serves as Lottie‘s anchor light. We have an electric one on the masthead but tend not to use it – lighting the lamp is part of the settling down for the night ritual. Our 22lb Danforth-style kedge lives in this locker along with a short length of chain and a grapple-style anchor for the dinghy. 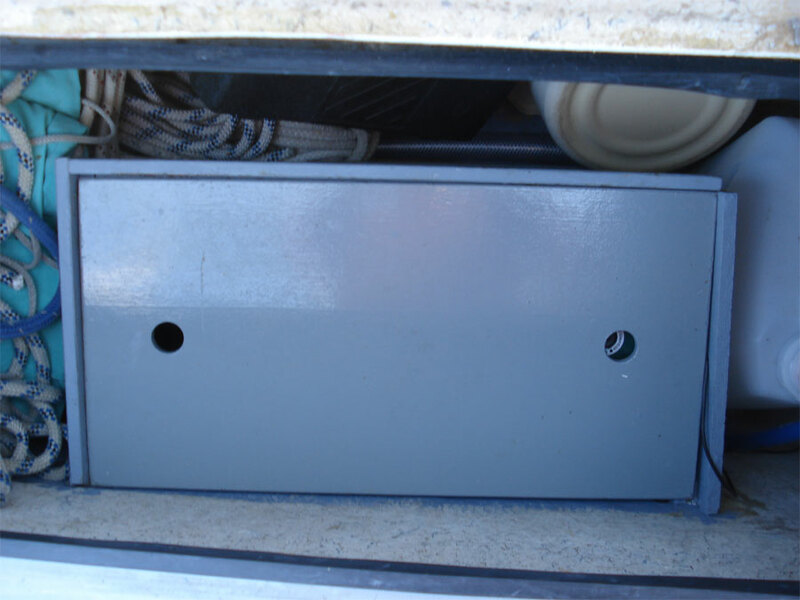 The starboard stern locker is largely taken up with the self-draining gas bottle locker. The port locker is filled with the light bulky stuff to help keep the weight out of the ends of the hull: four large sausage-shaped fenders and a couple of buckets. A spare Bruce-type kedge also lives in the bottom of the stern locker space for want of somewhere better to stow it.